28 Oct Are you ready to become a yoga teacher? Enrolling in yoga teacher training can be a scary thing. Not only is it a big commitment of time, energy and finance but it also brings up the question, “Am I ready?”. What if I’m not flexible or I can’t do a handstand? Teaching yoga isn’t about gymnastics or being the most flexible person in the room. While the intense practical side of teacher training will help you improve your personal flexibility and strength, being a teacher is about helping your students grow. Chances are, your students will appreciate your understanding of their flexibility (or lack thereof!) and your insight into modifications. What if I don’t meditate? It’s time to bust a big myth: you don’t need to have a regular meditation practice to start teacher training. As long as this is something you want to learn. 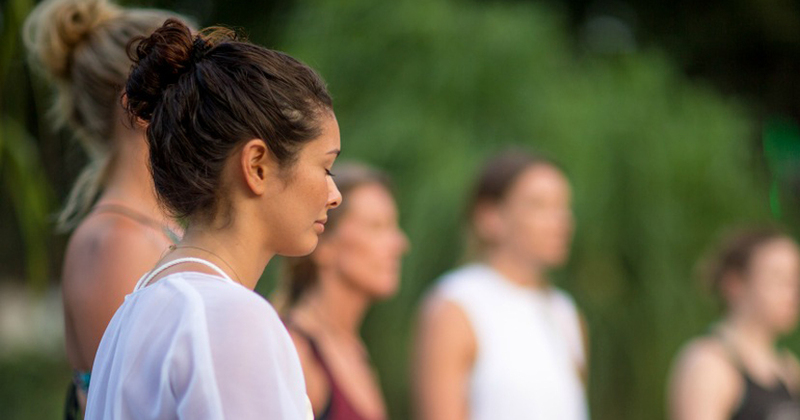 While meditation isn’t always easy to learn, teacher training will equip you with a number of techniques to help grow a daily habit. Not mediating or not mastering tricky asana don’t make you a bad yogi, they make you a great student. And the greatest teachers are the ones who always keep learning. The short answer is yes. Yoga teacher training is designed to challenge and transform you. Physical asana practice will challenge your body and all of the coursework will work your mind. If you step into training hungry for knowledge and looking to grow, you will gain so much. What if I don’t know anyone else on training? Teacher training is a great opportunity to meet and connect with like-minded people. Who knows – you could end up meeting someone who becomes a close friend, colleague or business partner! So what are you waiting for? If you’re thinking about taking the leap, it’s because you are ready. And we’re here to guide you on your journey. Want to know more? Check out our 200hr Teacher Training courses here. Already a yoga teacher and keen to learn more? Check out our 500hr programs.